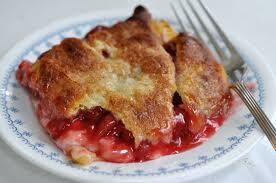 well today uncle Sam’s land also celebrates the national cherry cobbler day. To be honest I wondered what this cobbler was all about definitely not the shoe mender that was being referred to, and I figured that cobbler referred to a variety of dishes in USA and UK that consisted of fruit or savoury filling encased in batter, biscuit or pie crust. Some of them even resembled pies. There are many theories to suggest how this name came about, some culinary historians believe that it evolved from the word cobeler which was a specific type of wooden bowl used in cooking. Others were of the opinion that the desserts resemblance to a cobble stone created the name. There is also a drink called cobbler that could probably predate the fruit cobbler pie. This drink usually consisted of whiskey or rum with fruit juice and or sugar garnished with mind and/or citrus. This could be made with any fruit, single or in combination.